Call me obsessed. I probably deserve it. 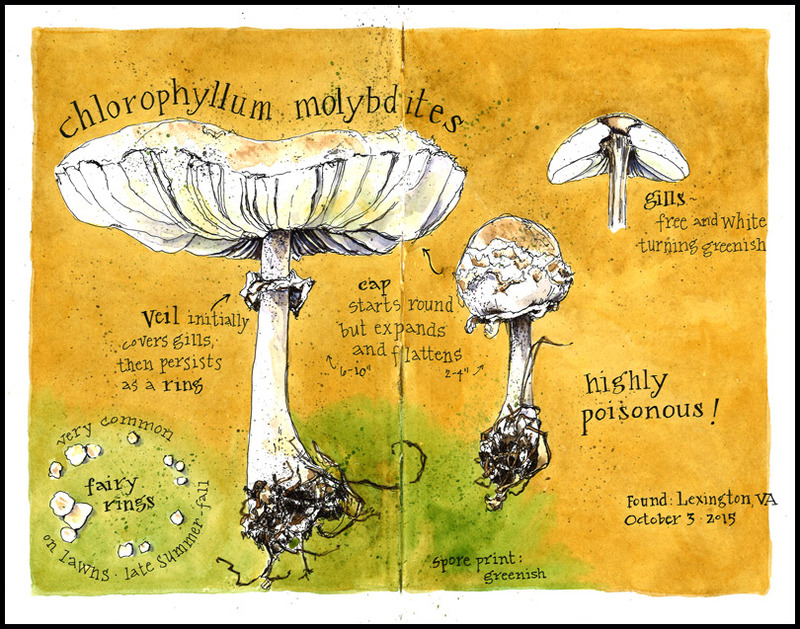 I have spent nearly every evening this week painting nothing but mushrooms, buying field guides, making spore prints, and staying up late trying to identify my finds. In my defense, a treasure trove is growing before me– new species emerging each day under the grove of oaks that line our driveway. And I know that the intense humidity and rain that brings them out, all too quickly turns them to mush. In the end, my obsession stems from being astonished: I have recorded an impressive 26 different species in a single week: classic gilled mushrooms, large and colorful boletes, tiny coral fungi, and ringed polypores. Consider this: several thousand species of mushrooms are found in the Northeast and upwards of 30,000 in North America. That’s more than all of the mammals, birds, reptiles, amphibians, fish, and plants combined. I found identifying them challenging, even maddening, but I learned to look more keenly at key features in the process. It’s likely that I misidentified some and I didn’t gather enough information to even begin to identify others. If you spot one you know from this collection, drop me a note so I can look it up. Within the last few weeks, more than ten species of mushrooms have emerged in a grove of oaks in our yard and I’m only familiar with one of them. Mushroom identification is complicated and depends on a number of factors that I tend to forget from year to year: whether or not there are gills and how they are attached, the shape of the cap, the color of the spore print, color, habitat, season, and more. For now, looking more carefully and making sketches and field notes before these ephemeral species disappear is more valuable than knowing the names. But soon, it will be good to have a guide to fungi on my shelf. Though I set out to paint these, I quickly decided to simplify and just use a mechanical pencil. It made it easier to move from one cluster to another and maximize limited sketching time. I found a ring of impressive mushrooms in the lawn outside my son’s apartment in Lexington, Virginia last weekend. It had been raining for several days, which brought on the fall bloom. Curious, I picked these samples, drew them, and then did some research to identify them and learn more. How fun to discover something so beautifully poisonous! I’ve done many pages like this over the years. I love finding something that I don’t know much about, sketching it, taking notes, reading and researching, and combining it all on the page. The result not only records my experience, it also advances my awareness and understanding as a naturalist. 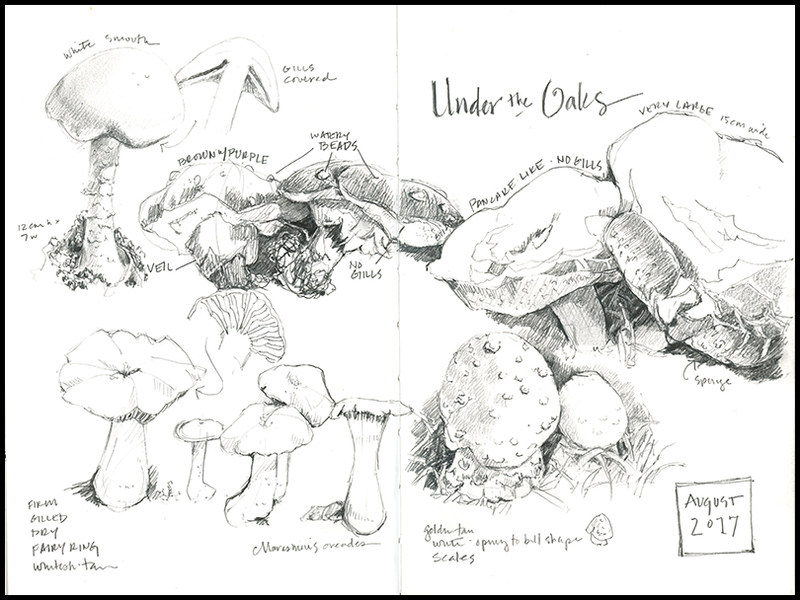 If you are interested in art and nature, I highly recommend creating your own field sketches and notes. Pick up something of interest and see where it takes you!